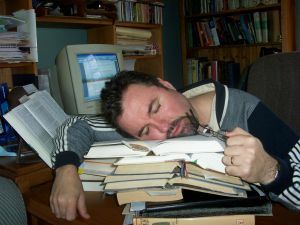 I recently read an excellent post titled “A Cool Look at Burning Out” by Paul A. Qualben at ChristianBibleStudies.com. In it he describes three stages in the burnout process documented by Cary Cherniss in his book, Staff Burnout. The honeymoon stage, in which enthusiasm, commitment, and job satisfaction eventually give way; energy reserves begin to drain off. The “fuel shortage” stage, characterized by exhaustion, detachment, physical illness, anger, sleep disturbances, depression, possible escapist drinking or irresponsible behavior. Then crisis-pessimism, self-doubt, apathy, obsession with one’s own problems, disillusionment with one’s career. Qualben also looks at the type of personalities most likely to experience burnout and suggests ways to counter burnout. It’s a great article for those of you evaluating your own burnout situations and wondering if a sabbatical would help. Check it out here. Let us know what you think of the article and if it helps in your evaluation of your own ministry and/or of your need for a sabbatical.